Notes: A very good copy of this extremely rare postmark. 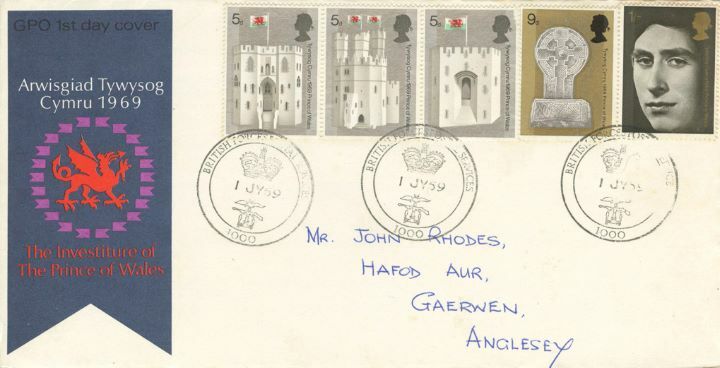 The above Royal Mail Prince of Wales Investiture stamps were issued on 01 July 1969 by Royal Mail and feature the following stamp designs: 3 x 5d Caernarvon Castle; 9d Celtic Cross; 1s Prince Charles. The BFPS 1000 Postmark first day cover with the BFPS - Forces, Crown, Special Handstamp postmark has been produced by Royal Mail/Post Office and features these stamps which can make a very collectible and lovely gift.